Surfer Blood's debut Astro Coast comes loaded with indelible, dance-friendly, but still excellently punk-raucous hooks and riffs that make it not only a solid first disc from the Florida band, but a window to a promising future. Astro Coast demonstrates Surfer Blood's early songwriting influences, drawing from Doolittle-era Pixies tracks like "Here Comes Your Man" (A comparison drummer TJ Schwarz said, "People don't say it often, but the Pixies are definitely one of our main influences" at the November 22 show in Denver) for a guitar-heavy garage feel that also grabs surf-rock progressions and thoughtful lyrics. There's a bit of Wolf Parade, and perhaps even baroque-pop '60s group The Left Banke. What's clear is that Surfer Blood understand how to write a great pop song. Astro Coast has numerous "single" type tracks that grab your attention and demand replay over and over, but the greatest upside is that for their grasp of pop fascia like riffs and hooks, Surfer Blood present thoughtful lyrics that have an airy, dreamer quality. The songwriting craftsmanship is most evident in songs like "Harmonix," "Twin Peaks," and "Anchorage." The hook is valuable, but it's the layers of verses and build-up, breakdown bridges and choruses that create a freshness that invites multiple listens without the pretensions that hinder enjoyment. Other tracks have shades of Vampire Weekend on them, but always with the fresh-faced Surfer Blood style. The track listing is well assembled as well. All too common with new, and sophomore releases, the best stuff is thrown upfront and the album tapers off into middling B- and C-sides. Not the case, here, as track one "Floating Vibes" sets the table nicely, but isn't the best song on the album by far. This album is most like a quality baseball line-up. "Swim" (likely the front-runner for early single) and "Take It Easy" dial up the writing, and then "Harmonix" delivers the run-scoring hit. Slow downs come as the album nears its end, but these songs all stand up independently, which is good for an iTunes universe. This is a very promising young band who could very quickly become one of the indie-rock elite. 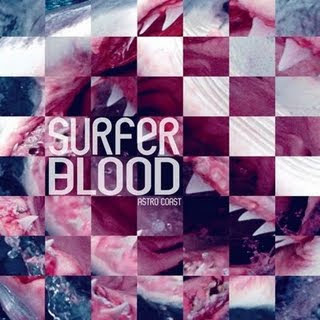 Check out Surfer Blood on their MySpace page here and then buy Astro Coast upon its release in January of 2010.